Is there anything quite like the feeling of cresting a hill and catching a glimpse of kites in the air as you approach a kite spot for the first time? That first thought, “It’s windy!” and the building excitement as you get closer and closer to the kite beach? This is a kite spot most of us have heard of and one many of us dream of one-day riding…it’s the kiteboarding mecca of Europe: Tarifa, Spain. For those of us who have only experienced kite spots in North America or the Caribbean, this is a completely new world. Tarifa has a rich and colorful history that will enchant both kiteboarders and non-kiteboarders. This city got its name nearly a thousand years before America was even settled…and it has been a wild ride ever since! In modern day, its ripping winds make this spot a wind lovers dream. Tarifa is one of the most reliable spots in Europe for wind, with more than 300 days per year of wind. Summer has wind throughout, though it is very crowded and some of the kite beaches close in the peak season. Spring and Fall are the best times to kite, and you can still expect an average of 4-5 days of rideable wind per week. There is wind in the Winter, but it is more likely to be rainy and cold. Advanced riders are only recommended to ride during Winter. Wind is very strong and gusty in Tarifa year -round, with typical windy days ranging from 20-40 mph. This spot is friendly for both adventure junkies and culture lovers. Try out mountain biking, land-sailing, hiking, SCUBA diving, sailing, SUP, ATVs, and more. There is also a cable park over an hour away in Marbella. For those who want to chill, Tarifa has many comfortable hotels, restaurants, and bars. The old city center of Tarifa is great for culture lovers. Road tripping to see some of the sights in the Andalusia region is well worth it on no-wind days. Little other than wind waves in the best kiting season. Spots that get decent waves, like Balneario and Rio Jara, close to kiteboarding during the summer season. There is some winter swell for advanced to expert level riders. There is a lagoon for freestylers at Rio Jara, but we do not advise to kite here. The conditions in the river mouth are dangerous. While you will often see kiters riding in the lagoon, it is illegal to kite in this spot. The wind and water conditions can be difficult for beginners, but the abundance of wind, well-equipped kite centers, and experienced instructors make this a good place to get involved with the kite community. Be cautious when selecting your kite school - we recommend Ion Club. Choose from one of many airports in the area. Fly into Jerez (1.5 hours away) or Malaga (2 hours away) to get on the spot soonest. A vehicle is essential for kiting in Tarifa to get to and from the kite spots. If you're staying near the city center, you'll be within walking distance of many restaurants, cafes, bars, and clubs. There are many options for accommodations for every group type and budget in Tarifa, from camping and hostels to nice hotels and villas. In Tarifa, you can expect around 300 days of wind per year, with the wind blowing day and night. What’s most important about this kite spot is you will rarely see 2 or 3 days in a row without conditions that work for kiteboarding. It’s one of the few spots where if you’ve planned a week-long trip, you’re guaranteed to get some time on the water. The best time to come and kite is between spring and fall. Summer is warm and has more thermal winds, but it is wildly busy – you’ll see more than 1,000 kites in the air some days! Many of the kite beaches are also closed in the summer months, so you only have a few stretches of beach to kite and they get even more packed. Winter is much quieter but can get cold and rainy. Winter kiting in Tarifa is best for riders who are very experienced as there are few resources available to kiters during this season. If you want to avoid the summer mayhem and winter chill, book your trip in spring or fall. Anytime between spring and fall, you can expect wind of 20-25 knots most days with much, much more on some occasions. Tarifa’s winds are known as the Levante (coming from the east) and the Poniente (coming from the west). Levante winds are most common in the summer and they rip. In my week in Tarifa, there were 2 Levante days where the wind was gusting up to and over 45 knots. Poniente winds are much calmer and less gusty but still blow around 20+ knots. You can expect to ride in mostly Poniente winds in the winter. Spring and fall is a happy medium on all fronts! This is most definitely a small kite spot – bring the smallest kites in your quiver! Wind in Tarifa is quite gusty in general, but this is the place to go if you want to be sure to get some sessions in. There’s not much that’s more disappointing than going on a kite trip and not getting wind. 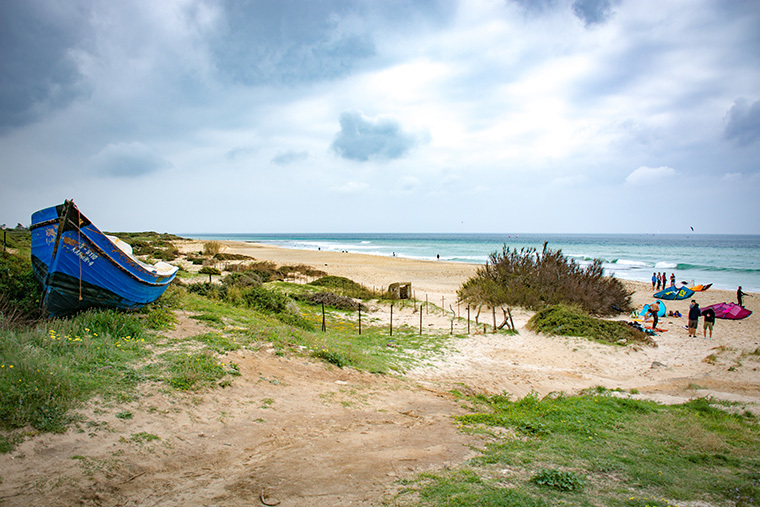 You’ll experience a wide range of weather in Tarifa throughout the year. Months to avoid are November to February, which is when you’ll expect more rainy days and weather that resembles freezing winter conditions. Spain does get snow in the mountains in winter! Summer days in Tarifa are hot like your typical European beach holiday, but once that wind starts ripping or the sun goes down, temperatures can definitely cool, so bring a jacket! I visited Tarifa in the spring and had a mix of super hot, warm and windy weather and a couple of cooler days where I had to bundle up to go outside. If you’re packing for a trip to Tarifa, bring layers! Water temperature calls for a 3/2 wetsuit for most of the year. Even in the cooler winter months, the water temperature stays fairly consistent. On hot summer days, you could get away with a shorty if you’re an experienced rider that won’t be spending too much time dipping in the cooler water. Tarifa has several launch spots that work in different wind directions or for different riding levels and styles. Because there are so many factors that contribute to riding in Tarifa, you’ll want to stop and check in with your local kite center to get the lay of the land. I’d recommend popping into Wet Watersports or Wet Café to meet some fellow kiters before you head to the beach. Keep in mind that many of Tarifa’s best kite spots are closed for kiteboarding in the summer, so stick to spring or fall trips if you want some choices. Balneario is the city spot. This is an iconic kite spot that you may have seen in several kite videos, including a famous megaloop over the pier by Ruben Lenten. This spot works best on Levante winds, but the wind blows straight offshore. This spot is restricted to advanced/expert level riders and is closed for kiteboarding in summer. Playa Los Lances is accessible from the edge of town and is a spot that works great for any and all levels of kiteboarding. The wide, long beach makes this spot work perfectly for beginners and lessons. This spot works best on a Poniente (West) wind, but it is also closed to kiteboarders during summer. Rio Jara is where the sea connects to the river, so there’s a wave spot on the ocean and a freestyle spot in the lagoon. You may see riders throwing tricks in the lagoon, but keep in mind that it is technically illegal to ride in the lagoon. The river mouth itself should be avoided as the currents are extremely dangerous. On the ocean side, this spot can work on Levante days when there is a swell, great for experienced wave riders. When the wave spot is working, this spot is an advanced/expert spot where the wind blows offshore with no safety services available. This spot is closed to kiteboarders in the summer season. Playa Los Lances Norte is the closest spot to Tarifa that is suitable for all riders at all times of the year, though you will need a vehicle to get to this spot. Here, you have miles where you have miles of wide, clean beach which make it perfect for kiters of all levels. This works best on a Poniente when the wind is blowing cross-onshore. Whether you’re a beginner rider or an advanced rider working on trick progression, this is a great spot to ride. Arte Vida is a spot that works best on Poniente (cross-onshore) wind and can have some waves if there’s swell in the forecast. This a great spot to bring non-kiters who can chill at the onsite restaurant protected from the wind – and you can join them after your session! This spot is closed to kiteboarders in summer. Valdevaqueros is probably one of the most popular spots in Tarifa, as it works on basically any wind direction, is open year-round, and is suitable for any and every level of kiteboarder. The curve of the beach means that if you run into trouble, you’ll get dumped back on the beach further down the bay. This is an awesome place to hang out for both kiteboarders and non-kiters, with great beachfront facilities, a grassy spot, and a restaurant and bar. The Ion Club is based here, which is a kite and windsurf school and shop. The Tumbao Beach Bar has tapas, snacks, and drinks and it’s a great place to kick back on the waterfront after your session. 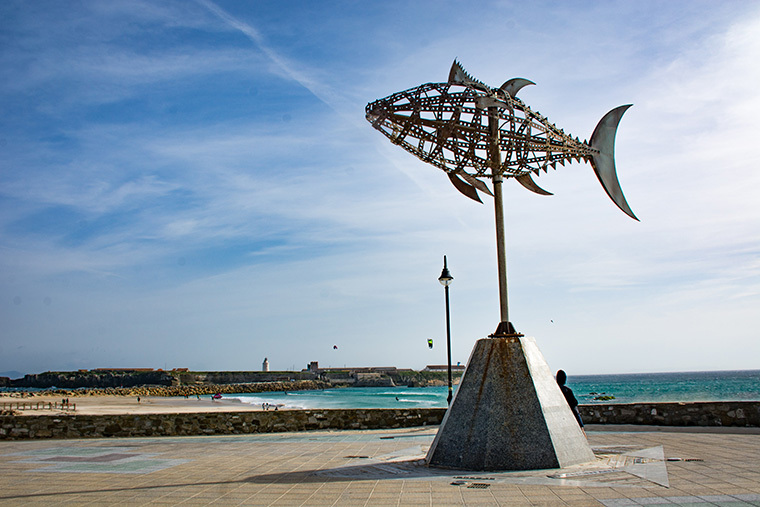 Palmones is quite far away from Tarifa, but this small fishing town is awesome for those who want to experience a more local vibe on a Levante wind. Expect flat to small chop conditions and a beach break here. This spot is closed in summer, and the river and marsh is closed to kiters. 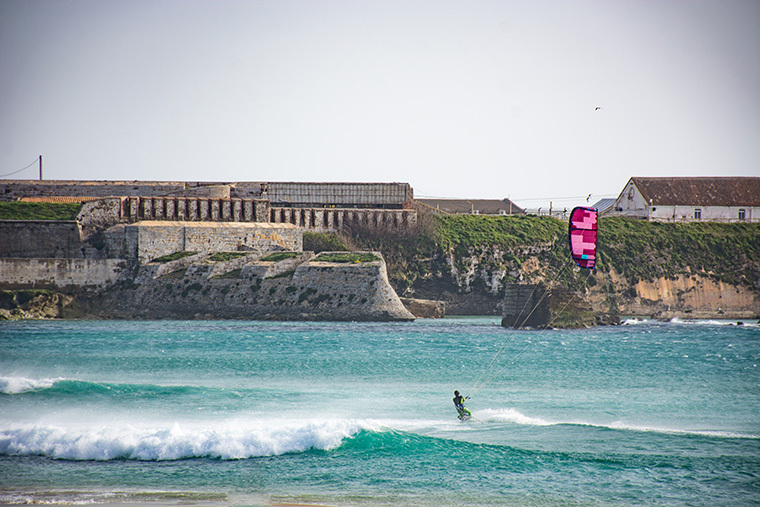 Los Caños de Meca is another spot that’s a bit of a drive but can be a unique experience for kiters. The Trafalgar lighthouse is here, there are shipwrecks underwater, and there’s a lot of history in the area. This one’s worth the trip for those interested in history or those traveling with non-kiters. This works in a Levante wind and you can expect organized waves here. This spot is closed in summer and is best for advanced kiters. Level: While the wind conditions make it a bit difficult for beginners on their first kite lessons, Tarifa is still a great place to learn - especially if you want a true introduction into the kite community. There are dozens of kite schools in Tarifa, but very few are quality...so be sure to do your research and ensure that the kite center you are riding with is certified and safe. We recommend Ion Club for lessons, where you are sure to be in good hands with experienced and certified instructors. On Levante days when the wind is strong and gusty, beginner riders will likely have a hard time. Those who prefer to avoid those difficult and sometimes dangerous conditions should stick with riding on Poniente winds. If you’re an experienced kiter, you’ll have a ball here in Tarifa - especially if you can find your way out of the crowds. It gets hectic here in the high season, but intermediate and advanced riders should be able to find their own bit of water to session. Style: Tarifa is friendly for every style of riding, but the strong winds and the crowded water make foiling a challenge here, except on those light wind days. The Levante winds are super strong and super gusty, but these winds make for epic big air conditions – you’ll see some serious kite loops and airs on the strong Levante days. There’s a big freestyle scene here in Tarifa, with many of the pro riders competing on the tour living here or making regular visits to the spot. The strapless freestyle scene is incredible to watch and it’s growing to be even bigger than the twin tip freestyle scene. Directional riders can have some fun on wind swell waves, but amazing wave days are few and far between. Facilities: On the beach, many of the kite spots have cafes on the beach that serve food and drinks. Off the beach and in town, you’ve got everything you could possibly need as a kiteboarder. 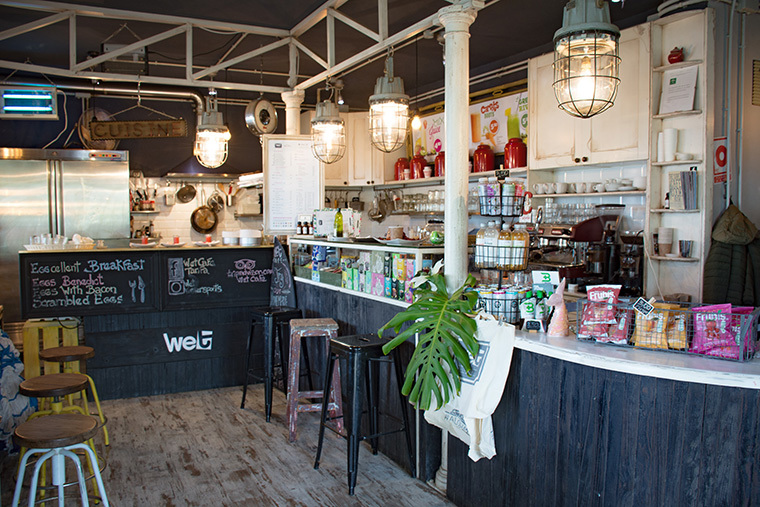 WET Café is between Tarifa and the kite beaches and is a fully stocked North and Ion shop that makes a great coffee and a delicious breakfast. This is a great place to turn up before your session to meet some fellow kiters, get oriented with the spot, and find out where to ride that day. Because this is such a kiteboarding friendly town, the beachfront hotels typically have facilities that are set up specifically with kiteboarding and windsurfing in mind. As a kiter, you’ll want a car to get to and from the kite beach. There are boat rescue services that operate at a few kite spots, and you can buy a rescue pass at your local kite center when you arrive in Tarifa. Cautions: The main thing to watch out for in Tarifa is those strong Levante winds. These often gusty conditions can be dangerous for riders that aren’t prepared to handle them. Bring your small kites! It’s also insanely busy in the summer. If crowds are not your thing, plan your trip for the spring or fall season. You’ll still get lots of wind but have a little room to breathe on the beach. This is a spot where you need to be very cautious of the other riders around you because there are so many of them and a huge range of levels. While most riders respect the right of way rules, it is always your responsibility as a kiter to avoid a collision – keep your eyes open! Some of these kite spots work best in offshore winds, which are not ideal for inexperienced riders. It’s highly recommended to pre-pay for rescue services for about 30 euros, so a bit will come to get you if you run into trouble. They do not operate at every kite spot, so check before you ride. If you run into trouble and haven’t prepaid, you may still get picked up but could expect to spend around or over 150 euros. Whether you’re traveling with a group of kiters or you’re in a blended group, every single person in your crew will find something to love about Tarifa. This beautiful city is a hub of adventure sport with a dose of rich history and culture. Here’s a quick start guide on travel to Tarifa… For a detailed travel guide – and one you can share with non-kiting travel companions - check out this article by Crystal Veness. You have several airport options in the area, so you’ll want to consider both your budget and your available time when choosing your airport. That’s a lot of options!! Lisbon and Madrid are bigger cities that typically have better prices on international flights and more direct routes from North America, while the smaller airports will get you closer to the kite spot and out on the water much faster. If you’re using Google Flights, you can type all of these airport codes into the ‘Destination’ field so you can do one search to see all of your options. If you’re traveling with non-kiters, choosing a further airport will give you that opportunity to explore some absolutely incredible European cities and take your time driving to Tarifa to explore some picturesque local villages along the way. If you’ve got a few days to spare on either end of your trip and don’t mind the long drive, this is a pretty cool way to do the trip. Whatever you choose, a rental car is pretty much a must-have for kiteboarding in Tarifa. Most of the kite spots are a long way from town. If you are staying in the old town area, you may have to find parking outside of the old town and walk in - I’d recommend avoiding trying to drive through the narrow streets here if you want to keep your rental car deposit! Also keep in mind that rental cars are easy targets for theft, so it’s best to leave your gear and personal belongings in your hotel room. Tarifa has plenty of accommodation options for every budget. There’s camping, hostels, hotels, and AirBNBs. They tend to get pretty busy in summer months, but in the spring and fall, you should have no trouble finding availability. Your choice on where to stay will depend on if you’re focused on kiteboarding every moment possible, or if you plan to dive into food, wine, and culture. Hostels start at about $20 USD per night for a bunk bed in a dorm room, and you have options all around town and Hotels are typically between $50 and $150 per night. AirBNB rooms are around $40-50 per night in someone else’s home, but you do have the option of renting an entire home or apartment with multiple beds for around $100 per night. This is the best value option for longer stays and traveling in groups. As far as where to stay? I loved being able to walk everywhere I wanted to and be close to restaurants and the party scene. There’s a lot of charm that comes with staying within the old city walls or near to it – and if you’re traveling with anyone who isn’t kiting, they’ll love being able to explore on foot. If you’re here to kite and nothing but, there are lots of hotels and hostels quite close to the kite beaches where you’ll be surrounded by your kiteboarding brethren! Food in Spain is an absolute treat...though mealtime in Spain can be a little hard to adjust to if you’re coming from North America. Locals usually don’t eat dinner until quite late in the evening and many restaurants and shops even close from mid-afternoon to later in the evening. Tarifa is a party hotspot, especially in the summer months. Things don’t kick off until well after midnight, and there’s every chance the party will go until the sun comes up. Wet Café near Playa Los Lances Norte is a must for any kiteboarder visiting here. Virtually every restaurant and bar will give you a small plate of olives when you sit down – delicious and locally grown. Order yourself a beer (cerveza), or a glass of the house white (vino blanco) or house red (vino tinto). Spain is known for its tapas or pinchos, which are small plates of food good for one or for sharing if you want to try several different flavors and types of food. Must visit spots for kiteboarders including Wet Café near Playa Los Lances Norte which has delicious breakfast foods and coffee. Tumbao Beach Bar is a great lunch spot at a busy kite beach and the best place for a drink after your session. 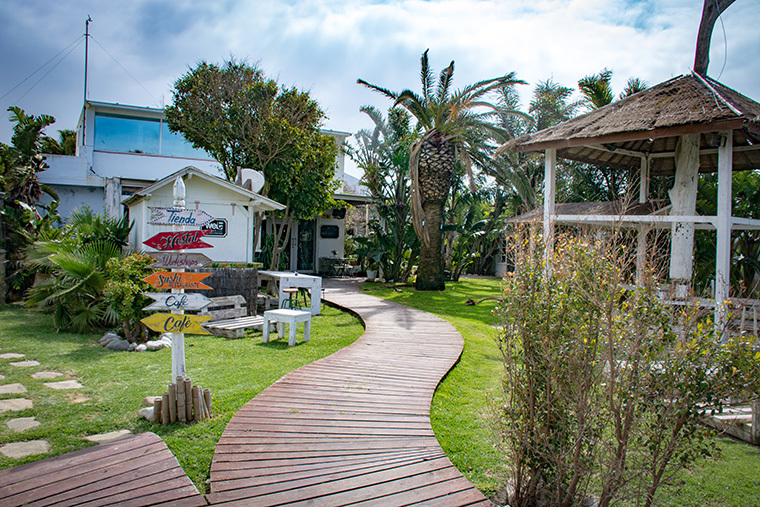 If you’re here for the kite scene, you definitely want to stop for breakfast at Wet Café which is near Playa Los Lances Norte and a great spot to connect with fellow kiters. Tumbao Beach Bar at Valdevaqueros beach is an awesome spot for lunch and a drink after your session. You’ll probably be pretty busy kiting here in Tarifa, but if you encounter a rare non-windy day or you have some travel companions that aren’t kiting, there is lots to do! If you’re into mountain biking, you’ll get to see some incredible terrain and views riding here in Tarifa. You can go on a mountain bike tour or rent a bike with Biking Tarifa. Landsailing is a fun and unique way to learn some sailing skills while ripping around in the dirt. There’s whale watching, horseback riding, hiking, and scuba diving.. and if you just can’t stand a day off the board, check out the cable park in Marbella. And there’s always sightseeing…there are seriously so many stunning beaches or views or even just tiny villages to drive around and explore. If you want to see old, authentic Spain? Make the most of your no-wind days! I’ve shared some of my favorite villages and beaches to visit in this travel guide. You can even take the ferry over to visit Tangier, Morocco – just be aware that this is a very touristy experience and not the best representation of Moroccan cultlure. 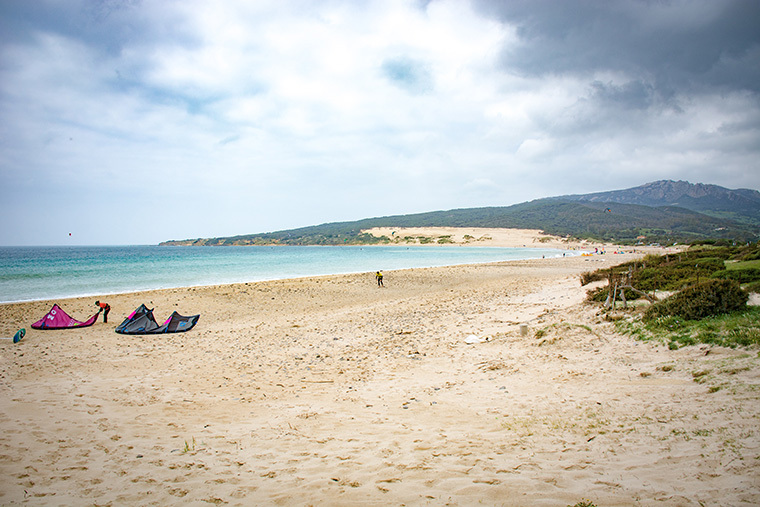 Tarifa definitely lives up to its hotspot status as a kiteboarding destination! The wind is pumping and the kite scene is absolutely stoked. But what really surprised me? Is how much more this spot has to offer. Spain is rich in culture and history and wonderful food experiences – this is a trip that kiteboarders and non-kiters will be blown away by. If you have any questions about this kite spot, send us a message or reach out to Crystal on Facebook or Instagram. See you next time on Destinations! We can’t wait to take you to the next Destination! North Kites USA team rider and a MACkite team rider. Originally from Canada, she now calls the entire world her home, playground, and her workplace. She goes where the wind blows - so if you see her at a kite beach somewhere in the world, say hello! Her primary goal is to share her love of kiteboarding and travel and all the lessons learned along the way with the world.